Posted on July 11, 2012, in Fitness, Health, Nutrition, Vacation and tagged Birthday, Foam Roller, Importance of Sleep, Laura DeAngelis, Lo-Cal Cocktails, Mental Health Breaks, Tabatas, Zumba. Bookmark the permalink. 14 Comments. 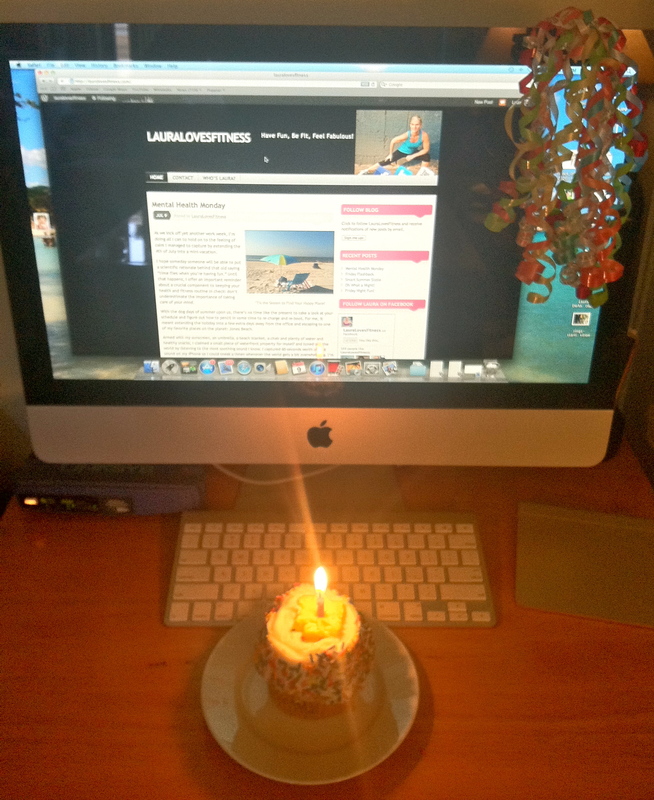 Congratulations – and happy blog birthday! Many thanks for the blog birthday wishes! Also, KUDOS to you for all you’ve done on your inspiring journey to a healthier you! Keep up the amazing work and I look forward to keeping track of your continued progress. Have a wonderful day! Wow, Katie! That’s the nicest compliment I could get! I started this with the hopes of helping others reach their goals and I’m humbled to know I could help you out a bit. Keep up your amazing work! Yikes! Time really does fly when you’re having fun! Congratulations Laura and keep up the great work! If it helps, you inspire me everyday with your tweets and friendly energy! You help to make me who I am (a good thing I hope)! Here’s to making the world a better place one cupcake at a time! Laura, congratulations on the milestone! Sticking to a regular posting schedule showed a lot of discipline, the same discipline that has made you fit and fabulous!! Thanks for a year of educating and inspiring! Hi Annette, Aren’t you kind?! Thanks so much for the congrats and for being such a strong supporter of my blog! Having that support makes staying disciplined that much easier 🙂 I look forward to sharing more information and learning even more for my own benefit in the days -and posts! – ahead. Thank you so much for the kind words! It’s people like you who have made the journey so much fun so far! And I’m happy to help keep you going, too!! Hey as you said, this is a celebration so I say go ahead and maybe have the ice cream AND the margarita! Have a GREAT night!